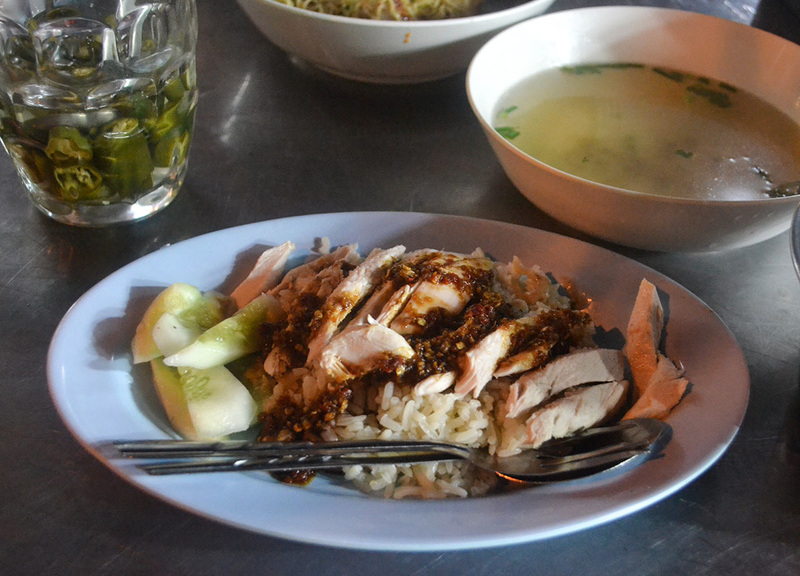 Khao Man Gai vs Singapore Chicken Rice? Obviously it’s up there with them other big questions, like, is there a God, and, where did Harold Bishop really go to during them five years at sea? Yet it’s a question I find myself asking much more often. 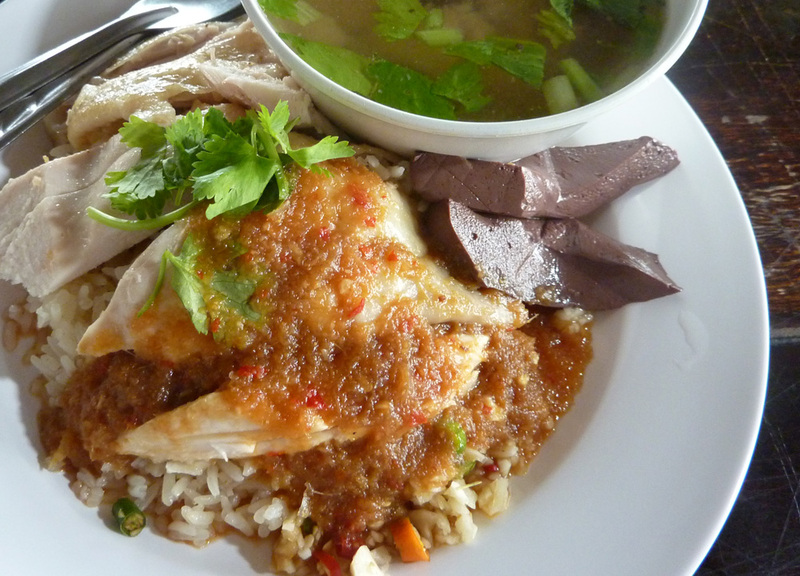 Which food is better, Thai Khao Man Gai, or Singapore’s Hainanese Chicken Rice. It’s always the first thing I ask when I meet a Singaporean in Thailand, and they do always insist, without a doubt, that Singapore’s Hainanese Chicken Rice is by far the superior. Yet, when asking a Thai person the same question, they appear to be more indifferent, and uninterested, and really just don’t seem to care. Because the humble Hainanese Chicken Rice, despite the diversity of cuisine in Singapore, is considered a National Dish, and a symbol of pride in the sovereign city-state (unlike the embarrassment of the Singapore Sling, which is just horrible). The perfect Hainanese Chicken Rice, which supposedly originated in Hainan China, has oily skin, tender meat and an important gelatine layer between. It is served on rice which has cooked in chicken broth, and is often shared with a drizzle of dark soy or chilli dip, maybe both. On the otherhand, in Thailand, Khao Man Gai only really exists in the background of the Kingdom’s more colourful cuisines, yet I’m fairly sure the Khao Man Gai stalls in Thailand outnumber that of the more internationally revered dishes, such as green curry, tom yum, phad thai. It only really loses out to Som Tam and maybe a handful of others. So it is a bit of an uninspired workaday food, served at cheapo food courts, next to charsui pork, roast duck, and stewed pork leg, which, between them, make up a hugely popular, yet rarely talked about, Chinese inspired subcuisine in Thailand. But it does seem at times like a last resort food, as it’s served often with the less appetizing parts of the chicken, including a bone stock soup on the side, and congealed chicken blood on top. Ethical, I guess, but I personally give the blood a miss. It’s a win for Thailand’s Khao Man Gai for me and it’s solely due to the complimenting chilli sauce, a combination of ginger, chilies, fermented soybean, garlic, white vinegar, and soy sauce. Thailand does appear to have a chilli sauce or dip for every occasion, but in terms of Khao Man Gai, it is perfect. And you may argue that the sauce isn’t part of the dish, but never have I ever seen a Khao Man Gai stall serve this dish without the sauce. And alongside the will also offer the simple soy and chilli sauces, similar to the hawkers of Singapore’s Hainanese Chicken Rice, yet they spend almost all their time on the shelves. Otherwise, served in its most simple form, or at it’s best, there should be very little difference between the two. 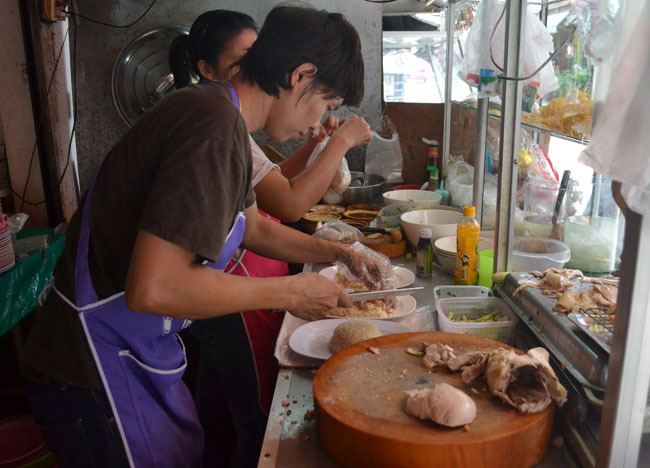 Hainanese Chicken Rice is Khao Man Gai, and for me, the perfect chicken makes little difference. The sauce comes first, and the rice a very close second, so the chicken just feels more like a condiment to the dish, instead of the sauce. But, sauces aside, do I think I could find better chicken rice served in Thailand over Singapore? No, don’t be silly. Thailand is a country synonymous for corner cutting and midday naps, against Singapore, a nation of foodies, critics and Michelin-starred hawker stalls. There is no comparison. No harm in a whopper (although I’d gravitate towards the Bacon Double Cheese Burger). Should check out fish head curry as well. It’s a mix of Singapore’s Chinese and Indian food cultures. Definitely some heat of it.